Vivian, my 7-year-old daughter, is devouring chapter books. She’s been through the Rainbow Magic series, Jigsaw Jones, Ivy and Bean, and Judy Moody. And the infamous Junie B. Jones. Now that I’m pitching my own book, I’m thinking about rejections. 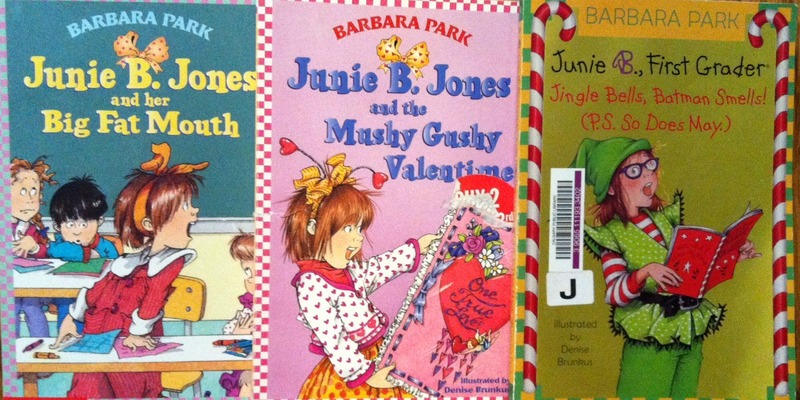 So here are ten Junie B. Jones titles that likely would have been rejected by publishing houses. What title of a book or series can you revise or invent so it’s reject-worthy? I don’t know the series of books, but this post is hilarious. This post is great! My 7 year-old son’s teacher has been inflicting the Bailey School Kids mysteries on us. These not-so-terrifying tales involve a pack of 3rd graders who (improbably) solve supernatural mysteries at their school. Every title contains a negative, like Vampires Don’t Drink Pink Lemonade, Zombies Don’t Coach Soccer, and Gargoyles Don’t Drive School Buses. I’m not sure why this series irritates me so. Well, actually, I do. They’re crappily written and don’t even try to engage you in the narrative world view. It’s kind of offensive how little respect they have for the imaginative capacity of kids. Choose Your Own Adventure: Busted or B*tch-Slapped? I know. Kathy = hilarious. Brilliant. And kind of scary. One of our favorites for this topic was always based on “Is Your Momma A Llama?” and usually went something along the lines of “Is Yo Momma A Crack-ho?” and went down hill from there. I have nothing…but I had an awesome laugh tonight thanks to all of you! I know. The comments are hilarious. I got nothing. Oh wait…Junie B. Jones Has Junk in Her Trunk. And you rhymed! Bonus points, clearly. I hate Junie B. Jones so I’ll just say that li’l miss sassy pants will definitely end up in Vegas. Those books were not allowed in our house. So glad I have a son who just wants to read about duct tape. I had to read these aloud they were so funny. And duct tape sounds interesting. My son reads latest fascination is sharks. He’s moving on to tigers now, I think… And bad jokes. The clever award goes to you! I’ve enjoyed the Junie B. series for years. I found the complex plot twist of “Junie B., First Grader: Toothless Wonder” to be particularly riveting. I laughed aloud (LA) at #5. The Junie book titles always make me think of old cautionary After-school specials like the classic ‘Dinky Hocker shoots smack’ ….shiver. I hope I’m not the only one who’s views of drugs were shaped by that. Ha! Love this post and all the comments. Bwahaha. She could do that quite affordably in Thailand, actually. As an English teacher, I cringed at Junie B. Jones books. Yes! Grammer. Loosing it. And don’t forget alot. As in there needs to be alot of space in the word a lot. Love your witty comment, Julie. Ha! Love these. They’re so inappropriate, they’re brilliant! Leanne, I’m so glad I stumbled on your blog. It’s fantastic, and I love a great laugh. Have you seen The Stupids childrens books? Thanks, Michael. It’s been quite a week for you. You so deserved to be Freshly Pressed! Oooh, Nancy Drew and the Mystery of the Vaginal Secretions. I always push the “too much” line. Because it’s hilarious! What a wickedly clever mind you have stashed away in that pretty little head of yours! I know that somehow sounds sexist, but it wasn’t meant to be – seriously! From you, it’s an absolute compliment. Thanks! When I read your blog out loud to my wife (she’s also a Leigh Ann) she gasped when I mentioned Jennie B. Jones books. My Leigh Ann is an elementary school teaher who blogged about her thoughts on these books. Because she thought some may not like her thoughts, she left out any reference to JBJ. Just my thoughts. My wife, whose blog is Mom2momtoday.wordpress.com has her own thoughts. I don’t know if you want want to see any profanity. These titles were more than slightly hilarious! I’m relieved that my son finished the JBJ stage of reading long ago. I remember a particularly horrible audio book adaptation of one title: Junie B. Jones Comes to Terms with Being a Rejected Character from the Magic School Bus.